An extremely rare and important member of the Flying Dragon Dollar pattern series. Missing from many major collections and with only seven pieces having been graded. The finest certified specimen example at NGC. Old envelope toning throughout showing deep toning over much of the obverse with a lighter sheen on the reverse. Both sides showing strong underlying luster and orange and blue highlights in the protected areas in the devices. 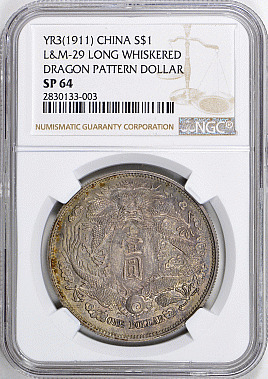 A coin sure to take a place of prominence in the collection it enters. From the Cherrywood Collection.